A visit to Cannes will present you with glitz and glamour. Cannes is renowned for the annual film festivals that see as a number of actors, actress and famous people to the area. Lerin Islands is of particular interest in Cannes, it is a group of four Mediterranean islands, each with its own story and attraction. St Marguerite Island, which is one of the largest islands of the four is said to have housed the Man of the Iron mask while St Honorat, which is also a large island is home to Cistercian monks. Cannes also boasts of a number of museums such as Musée d’Art et d’Histoire de Provence which holds a number of historical features that retrace everyday life in the province from prehistoric times to the present day. Illustrations of the Provencal way of life are illustrated through pottery, furniture, paintings. Santons and traditional costumes. There are also a number of beaches to visit and relax the day away as well as ports to which you can anchor your luxury yacht. 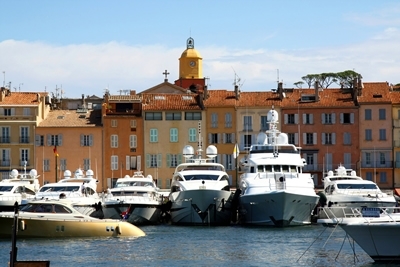 Saint Tropez which boasts of a wonderful climate is a famous yachting region south of France. The area offers a number of attractions such as the Saint Tropez Harbor which is frequented for scenic historic walks. The Place des Lices market, which is a street or flea market that offers a number of different merchandise to suit most needs from food items to clothes, shoes, jewelry and antiques, making it a must visit while in the area. Antibes, apart from Saint Tropez also attracts a number of yachts to its waters. Attractions to the area include the Picasso museum that showcases some of Picasso’s works of art as well as Fort Carre, which was used to protect Antibes from Nice. Still in Antibes, when you pay a visit to Port Camille Rayon, you will be amazed at the beautiful display of the fleet of boats, ship and yachts. In case you fancy a bit of paddling while in Antibes, then you need to pay a visit to Cap d’Antibes where you will have the chance to use a paddleboard on the clear blue waters of the Mediterranean Sea. Other yachting destinations include, Porquerolles, which is an island that is lined with cliffs to the south coast, ports and beaches to the north coast and five small ranges of hills. Massif de l’Esterel on the other hand comprises of hills, cliffs, and mountains. There are also resorts and beaches in the area that are situated along the coast. In short, the Riviera provides for a wonderful yachting experience.